Jan Hus is condemned as a heretic and then burned at the stake. On 6 July 1415, the Czech religious reformer Jan Hus, condemned as a heretic against the doctrines of the Catholic Church, was burned at the stake. This date has long been a Czech national holiday in his honor. The story of Jan Hus is more than a question of internal church disputes. As a priest, philosopher, and Master at Charles University in Prague, he is considered, after John Wycliffe, the English theorist of ecclesiastical Reformation, the first church reformer, living before Martin Luther, John Calvin and Huldrych Zwingli. Hus was a key predecessor to the Protestant movement of the 16th century. His teachings had a strong influence on the establishment of a reformist Bohemian religious denomination and, more than a century later, on Martin Luther himself. A century after his death, as many as 90 percent of inhabitants of the Czech lands were non-Catholic; to this day some still follow the teachings of Hus. In asserting their independence from Rome, the Hussites represented an early expression of Czech nationalism. After earning two university degrees, Hus was ordained as a priest in 1400. In 1402 Hus began preaching in Prague demanding the reformation of the Church. Hus tried to delineate the moral failings of clergy, bishops, and even the papacy from his pulpit. He enjoyed some local support, but on June 24, 1405, Pope Innocent VII, directed Hus’s archbishop to counter Wycliffe’s heretical teachings, and to ban any further attacks on the clergy. Hus, however, continued to promote Wycliffe’s ideas. Like Wycliffe, Hus spoke out against indulgences. Hus asserted that no pope or bishop had the right to take up the sword in the name of the Church; that a Christian should pray for his enemies and bless those who curse him; and that a person obtains forgiveness of sins by true repentance, not by a donation of money to the church. Hus’s followers considered the church a fraudulent mob of adulterers and “Simonists,” people who bought their positions. In response, three men from the lower classes who openly called the indulgences a fraud were beheaded. They were later considered the first martyrs of the Hussite Church. Sigismund of Hungary, who was “King of the Romans” (i.e., head of the Holy Roman Empire, though not then Emperor), and heir to the Bohemian crown, was anxious to end religious dissension within the Church. He arranged for a general council to convene in November 1414, at Konstanz in southern Germany, on Lake Constance just across from Switzerland. The Council of Constance became the 16th ecumenical council recognized by the Catholic Church. Hus willingly agreed to go to Konstanz, under Sigismund’s promise of safe conduct. A few weeks after his arrival in Konstanz, Hus was arrested and thrown into the dungeon of the Dominican monastery. In December a formal investigation against Hus began, but Hus was not allowed an advocate for his defense. Transferred to the castle of the Archbishop of Konstanz, Hus was kept for 73 days, separated from his friends, chained day and night, poorly fed, and ill.
On June 5, 1415, his trial began, and Hus was moved to a Franciscan monastery. He declared himself willing to recant if his errors should be proven to him from the Bible, but otherwise defended his reformist protests against the Church. The condemnation took place on July 6, 1415, in the presence of the assembly of the Council in the Cathedral. After the High Mass and Liturgy, Hus was led into the church. He protested that even at this hour he did not wish anything, but to be convinced from Scripture. He fell upon his knees and asked God to forgive all his enemies. At the place of execution, he knelt down, spread out his hands, and prayed aloud. The executioner undressed him, tied his hands behind his back, and bound his neck with a chain to a stake around which wood and straw had been piled up so that it covered him to the neck. At the last moment Hus refused to recant and thus save his own life. Hus’s ashes were thrown into the Rhine River. Responding with horror to Hus’s execution, the people of Bohemia moved even more rapidly away from papal teachings, prompting an announced crusade against them. Pope Martin V issued a papal bull that all supporters of reformers like Hus and Wycliffe be slaughtered. Some two thousand Hussites were thrown into the Kutná Hora mines by pro-Catholic townsmen. The Hussite community became a major military power, and defeated a wave of crusades that lasted until 1434. Fighting ended with a compromise in 1436. According to Hus, the Church is not the hierarchy; it is the entire body of those who have been predestined for salvation. Christ, not the pope, is its head. It is no article of faith that one must obey the pope to be saved. Neither membership in the Church nor churchly offices and dignities assure that the persons in question are members of the true Church. Hus’s theology predates by almost a century similar developments that would take place in the Lutheran Reformation. His extensive writings earn him a prominent place in Czech literary history. Nearly six centuries later in 1999, Pope John Paul II expressed “deep regret for the cruel death inflicted” on Hus. Cardinal Miloslav Vlk of the Czech Republic was instrumental in crafting John Paul II’s statement. Richard III is crowned the King of England. 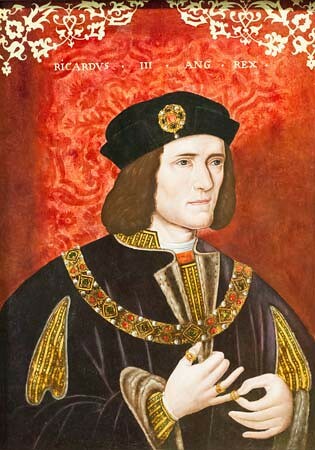 Richard III, also called Richard Plantagenet, duke of Gloucester, born October 2, 1452, Fotheringhay Castle, Northamptonshire, England—died August 22, 1485, near Market Bosworth, Leicestershire, the last Plantagenet and Yorkist king of England. He usurped the throne of his nephew Edward V in 1483 and perished in defeat to Henry Tudor at the Battle of Bosworth Field. For almost 500 years after his death, he was generally depicted as the worst and most wicked of kings. Some of those charges are now regarded as excessive, the work of his enemies, and his supporters have attempted to rehabilitate him. Modern scholars take a more-balanced approach that avoids the extremes of either side. Richard III presented himself as a reformer committed to justice and morality who would remedy the supposed misrule of Edward IV’s last years and the sexual license of his brother’s court. His signet registers reveal plans to improve the management of the royal estates and the north. He also came to an agreement with Queen Elizabeth and the Wydevilles. She accepted him as king, and he allowed her and her daughters to emerge from sanctuary and provided for them. Unfortunately, his good intentions could not be implemented in a reign of only two years or in the face of serious opposition. The French defeat British naval forces during the American Revolutionary War. The great New Zealand running coach Arthur Lydiard is born. See more on him at Running Heros.